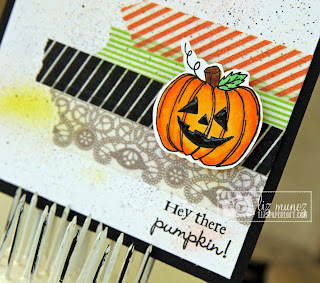 Liz's Paper Loft: Halloween Hustle Day 2 ~ hey there pumpkin! Welcome to our 5 days of "Halloween Hustle"! Yep, we will have 5 days worth of last minute ideas to trick your treats! You will ALSO see 3-D projects, home decor & even cards! I hope you are ALL ready for some HALLOWEEN HUSTLE "FUN"! There will be giveaways all week! Check Emma's blog to see what it will be! Also, if you missed out on our sale last week! Well....for this weekend ONLY, starting this Friday 10/25/2013 @ 12:01am PST thru Sunday 10/27/2013 @ 11:59pm PST you can use the code OCT2013 to get 20% off your entire order in the My Creative Time store HERE! Remember when Emma told you about making a "Teeny Tag Holiday" stamp set? WELL....wait no longer, it will be available this Friday, 10/25/2013 in the My Creative Time store HERE! This is super adorable Liz! What a cute Halloween card! super fun card..love the washi! Super cute, love the way you used the washi! Cute card Liz! I love the washi tape and I love the spritzed background! Super cute card, love the elements, and the sentiment. I love this card Liz! 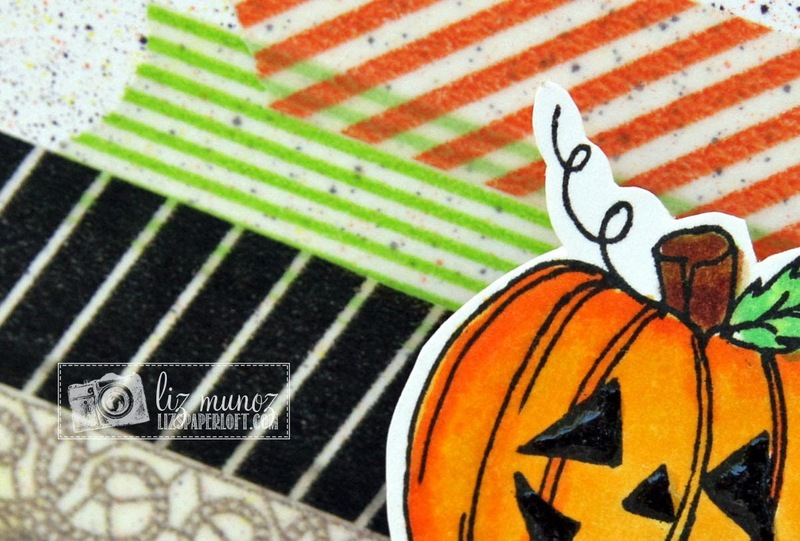 I love the MCT pumpkin on the washi tape background. Clever! 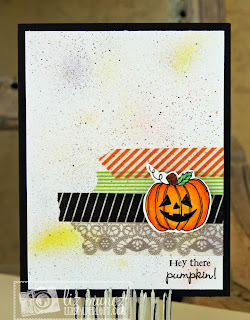 This is a very cute card with lots of adorable Halloween creativity! Nicely done! What a fun and festive card!! Love the little pumpkin on top of the washi tape. Another fun project with washi tape. I love the little dies with the All Around Holiday set. Oh Liz what an awesome card yep wicked awesome my gosh you are an artist you really did a spooktacular job coloring your pumpkin and making the card look so shaby chic. Great way to use the washi. Love how you used Miss Emma's goodies!! That is a really cute card. You did a great job on your project! What a cute card. I love pumpkins. What a super cute card! Love the little pumpkin! TFS! So cute! I like the different patterns and colors of the washi tape...it really works! Thanks for sharing your creative talents! 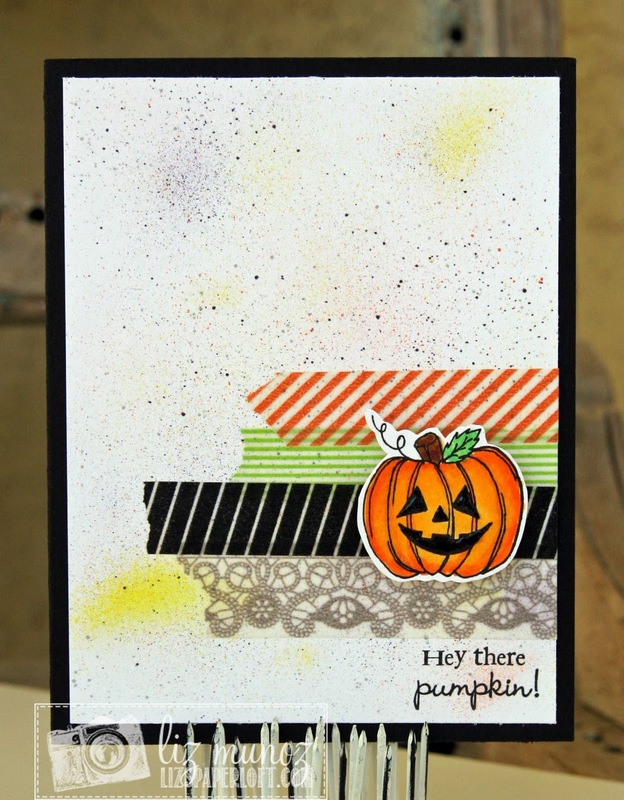 I love the airbrush and splatters and beautiful Washi Tape that is perfectly Halloweenie! I love Emma's little pumpkin, he is my favorite. Beautiful card! Liz, you've amped up my excitement for my new products to arrive. I want to play, too! Your site is always a place of amazing inspiration and awe-inspiring creativity! Love your card; truly a work of art! Liz, this is so adorable! Super cute pumpkin! Great card Liz, I love the Washi Tape!! Your card is terrific. LOVE it. TFS. So cute, Liz! I love the splatters and the wash tape!!! Wonderful use of Washi Tape and making your cute pumpkin stand out. Great card! Adorable pumpkin and fun use of washi tapes! Liz ~ well I must say I ADORE your card!! First you using washi ( have quite a few) but never use it!!! Then the pumpkin coloring and the splatter effects~ TOO COOL!!! !